It’s Wednesday Nov. 29th and the Green Box is out again! This week we are featuring the Italian designer, Roberto Coin. Roberto Coin features a timeless and sophisticated look with each piece fashioning a hidden small ruby that rests against the skin. This tradition comes from an ancient Egyptian legend that the ruby, if held against the skin, promotes long life, health and happiness. Also this weekend, Dec. 1-2, we’re having a huge, 3 designer show featuring Roberto Coin, Eli Jewels and Ashi. These designers will be bringing some jaw-dropping pieces into Windsor for the event. 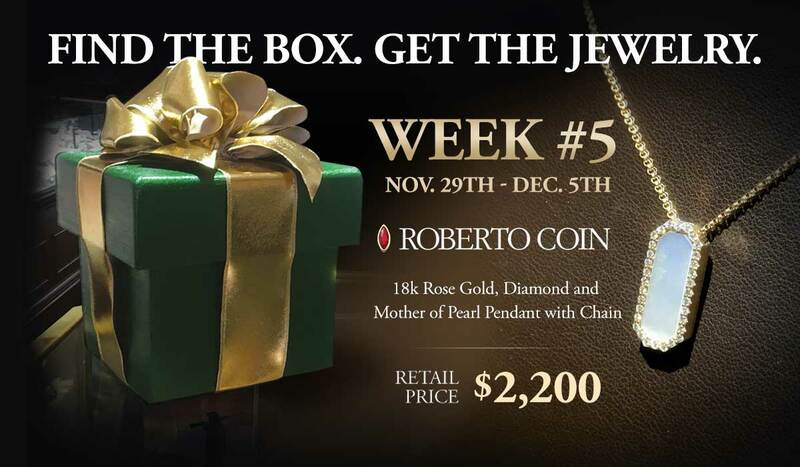 The piece of the week the box finder will receive is a Roberto Coin 18k Rose gold, diamond and mother of pearl pendant with chain. The piece retails for $2200. Please keep in mind, that our box is not hidden in a place that is dangerous. If you would like a clue in a day in advance, come in and try on a piece of Roberto Coin. The box is not on a churches grounds… please be respectful of plants that belong to someone else. This location can be seen without moving any foliage. Wednesday Nov. 29th Clue: Where two would come together. Thursday Nov. 30th Clue: Once where it was bright, today, it rests in shade. Friday Dec. 1st Clue: Where a hat could change the course of events. Saturday Dec. 2nd Clue: You could call it a custom, but it’s one from the past. Sunday Dec. 3rd Clue: The seconds were to ensure a fair situation.